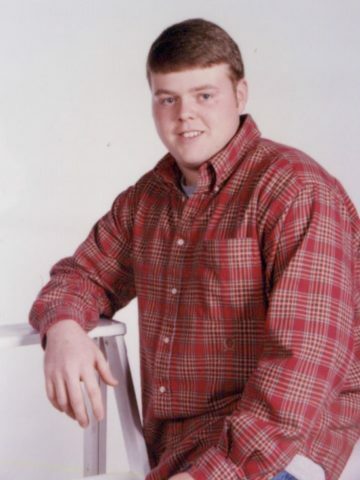 Randall Dugan “Randy” Clinard, age 37 of Springfield passed away on April 19, 2018 at Skyline Medical Center. On December 24, 1980, Donnie and Marsha Clinard welcomed into the world a beautiful baby boy. He was named after his maternal grandfather, Dugan. Since he was young, Randy had a cheerful disposition and was a comical relief when times were hard. Randy had a love for cooking and creating new dishes for the family. When he wasn’t cooking you could find him outdoors working with his dad on the family farm. Family was important to Randy and was so proud of his nephew, Nicholas. He loved spending Thanksgiving dinner watching football. Christmas Eve was always spent celebrating his birthday and enjoying time with his family. Randy had many friends; most weekends were spent rolling dice with his buddies and watching the Nashville Predators with Ashley. He treasured his time with Percy and Ginger cuddled up on the couch watching movies. He loved loud trucks and driving down the backroads of Robertson County. He enjoyed life to the fullest and had a tender, compassionate heart. He loved helping others, for this reason, Randy’s wishes were to be an organ donor. Randy will forever be remembered as a loving son, brother, uncle, fiancé and friend. He is preceded in death by both his paternal and maternal grandparents. Randy is survived by his loving parents, Donnie and Marsha Clinard; his sister Lindsey (Daniel) Givens; nephew, Nicholas Givens; fiancé of 15 years, Ashley Baker and a host of aunts, uncles, cousins and friends. A Life Celebration will be held at 11am on Tuesday, April 24th with Brother Steve Freeman officiating. The family will receive friends on Monday, April 23rd from 4-8pm then again on Tuesday from 10am to the time of service. The family request in lieu of flowers donations be made to the St Jude Children’s Research Hospital: 262 Danny Thomas Place, Memphis, TN 38105. I am so sorry for your loss. I am continuing to pray for the family. This is a difficult time, but I hope love, hugs, kisses, and patience helps lighten that burden. We love you Lindsey. And will continue to pray for you all. You know that you and your family are in my heart and you know that I love you. I hope that GOD can give you some peace in this hard time. I may not always be able to be with you in person but I hope you know that you’re always in my heart. Marsha, I am so very sorry to hear about your son. You have always been very special to me, even though we didn’t see each other for several years. I will keep you and your family in my thoughts and prayers as you go through this difficult time. He was a very kind smart man that more men should take lessons from. I am sorry for your loss and the pain you are going through but know he IS in a better place than here. Man bro I am just still dwelling on this. We met in 1986 in kindergarten and 2as was buddies from there on. If I don’t make it to visitation today homey its simply because I can’t do funeral homes. Man give my Boy Craig Daps and tell em I said what’s up. Man again dude this has just really bothered me. Love ya Bro and RiP for me!! My heartfelt sympathies are extended to you at this time. You are in my thoughts and Prayers. Words just do not express how sorry I am for your loss. May God give you comfort to help you during this difficult time. My love and condolences to you and your family. I want to extend my condolences to Randy’s family and friends. It is never easy when we lose a dear loved one. of Randy can be a source of comfort for you. I am so sorry for your loss. I taught Randy in school. You can be assured that he was well behaved, had the eagerness to try and do his best– a reflection from his family I’m sure. You will be in my thoughts and prayers. May God bless you during this difficult time. Marsha I am very sorry for your loss. My thoughts and prayers are with you & your family. I am just now seeing this and I can’t tell you how very sorry I am. I cannot imagine the pain of losing a child. I love you and will pray that you may have peace and find much joy in the sweet memories you have with Randy. Keeping you in my thoughts and prayers.